If you have done the Ruined Castle walk and looked north towards Narrow Neck you would have noticed a predominate headland reaching out from the eastern cliff line of the Neck. Known as Castle Head, this forms some of the western cliff surrounding the spectacular Jamison Valley. The mission for this trip was to abseil off Castle Head. All three of us had never been there before, despite all our combined bushwalking, canyoning and rock climbing experience. With printed track notes in hand, we left the Narrow Neck locked gate car park at about 9:30am. We had plenty of gear with us. As Albert was the only person who owned ropes, we brought with us two of his 55m ropes. This worked out well was we could set up two abseils at a time and we could also do the 40 m abseil in one go. After only 20 minutes walking we had reached the first of many lookouts on the trip. 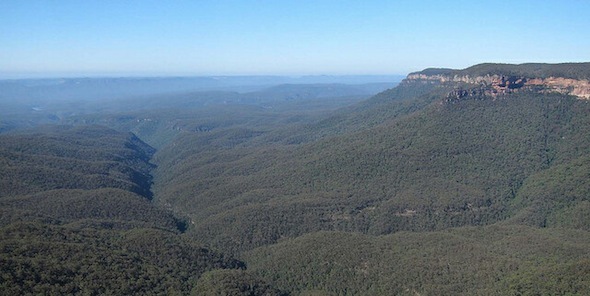 This lookout gave us views across the Jamison Valley, Katoomba and the Three Sisters. We stopped briefly for a few photos and continued onto Castle Head trig. Along the way, we found another lookout which gave us views of the rest of the Narrow Neck plateau, Cedar Creek valley and the Wild Dog Mountains. We reached the Castle Head trig in no time and continued on to the edge of the cliff line where we found the anchors for the first abseil. We geared up here and set up for the 25m abseil. The track notes said “Abseil left handed and reach out for a tree on the right”. As Albert was the most experience, we all agreed he should go first. Within a few minutes we heard “off rope”. It was then Lilian’s and my turn to abseil down. As we abseiled down, Albert went ahead and used the second rope to set up the next 15m abseil down to the next level. We all managed these two abseils comfortably and continued on. As we completed the first abseil, another group were hot on our heels, ready to abseil down the first drop. We could see that their rope was clearly less than 25m long and too short for the abseil. Also, there were no knots in the end of either rope. We yelled out to the first abseiler that their rope was too short. Luckily, they could just swing across to the right and land on a high boulder near the cliff face. After the second abseil, we continue across at this level and found the anchors for the third abseil. 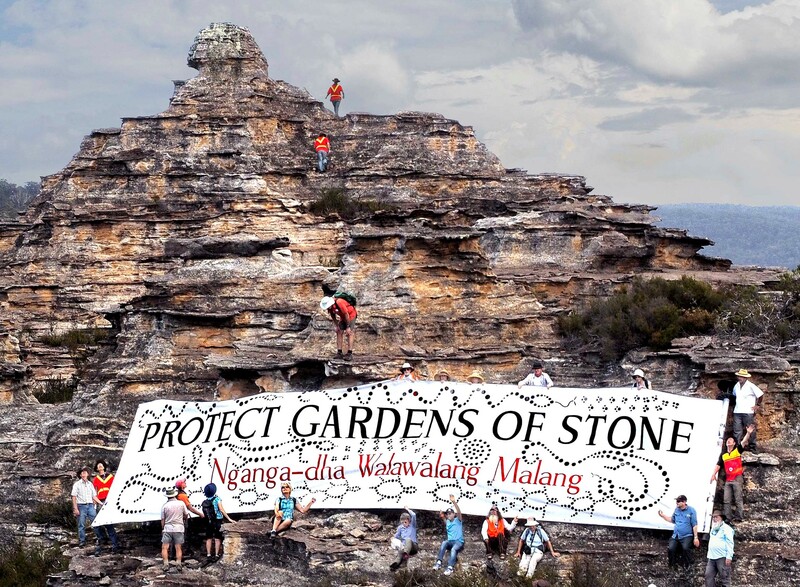 From the top we had more spectacular views of Ruined Castle, Mt Solitary, Jamison and Cedar Creek valleys, and also Lake Burragorang. 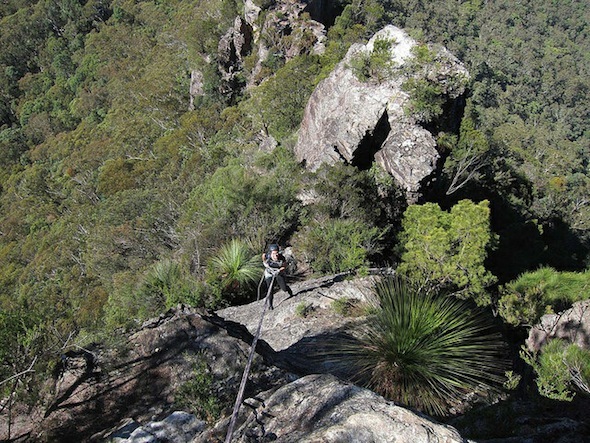 The third abseil was about 15m, but the anchors were 5m from the cliff edge. This meant it was really hard to pull the rope down. We all abseiled down and retrieved the rope, ready for the next drop. This next bit was interesting! Firstly, we scrambled down off a large boulder and headed out to the next point. As mentioned in the notes, there is a small gap along the ridge. You can either jump or abseil down and climb back up. The jump option didn’t look the best, so we abseiled down about 10m and climbing back up. It was then a very short walk to the next big drop. 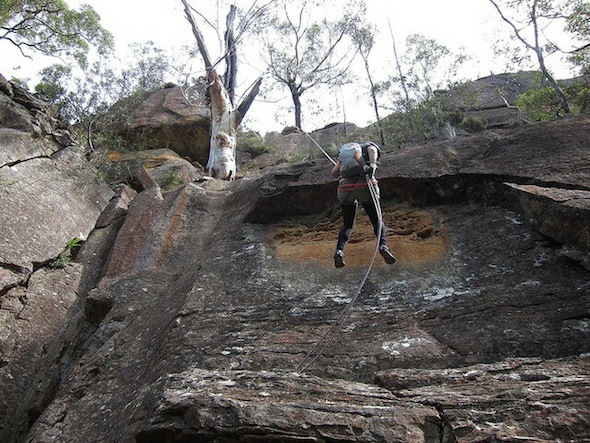 This next abseil, which was 40m long, could be done as one (with long ropes) or two abseils if you have shorter ropes. As we had a pair of 55m ropes, we did the abseil in one drop. It was the longest and most spectacular abseil, with the bottom half being overhung. We quickly pulled the ropes down as the group behind us were waiting at the top. It was then a short walk to the next abseil, a 25m drop that would get us to the saddle between Castle Head and Ruined Castle. 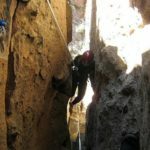 We completed the final abseil in no time and packed our gear away. As the weather was fantastic, we planned to have lunch on Ruined Castle. We stopped for a few photos on the way, but it didn’t take us long to walk across the ridge to Ruined Castle. It was very busy with lots of families. Perhaps being the day after Good Friday and a long weekend had something to do with it. Despite the crowds, our small group managed to climb to the highest rock outcrop at Ruined Castle and it was here that we scored the highest viewing area. We took this opportunity to have lunch and enjoy Easter eggs whilst absorbing the views of Castle Head and Mt Solitary. It was interesting to look back at the mountain you had just abseiled. All that was left was the 4km walk back to the Golden Stairs and up to the car park. We knocked this off in just over an hour. A fitting end to an adventurous day out. Highly recommended.